ArabLit: How did Jetties start? Why Mohammed Dib? Madeleine Campbell: Mohammed Dib was born in Algeria in 1920 and his native language was Arabic. Although he is said to have attended Koranic school, he first learned to read and write in French. His writing reflects this early disjunction between the cognitive and affective self, which arises when one is schooled in a language alien to the home environment. Everyone is exiled in some sense, and through his use of language Dib displays a singular ability to stage, and perhaps to exorcise, this universal sense of alienation. 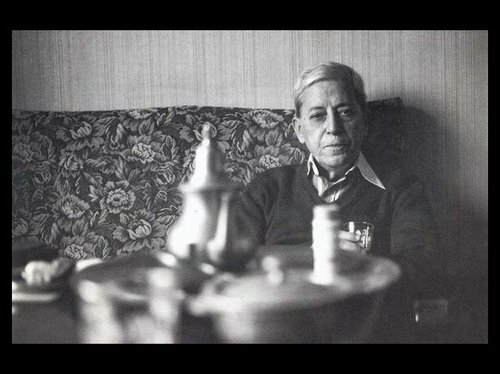 From the publication of his first novel in 1952 until his death in 2003, Mohammed Dib made a contribution of considerable critical and historiographic relevance to Maghrebi literature. Jetties is both an assemblage of fragments of Dib’s writing and a collective of artists and performers involved in ‘translating’ his poetics through sound, gesture, movement and sculpture. The idea for Jetties arose when I was translating Mohammed Dib as part of my PhD. Instead of focusing on one or two poetry collections or novels, I felt that translating fragments from the whole range of his works would provide a better insight into his oeuvre. Although much of his life was spent in exile, his writings span more than fifty years of Algerian history. Loosely assembled into five nodes, the resulting manuscript of translated texts has been conceived as a platform for intersemiotic interpretation which can be fragmented and reassembled to construct ephemeral narratives that engage with a variety of frames and contexts. In L’Arbre à dires (1998), Dib describes his œuvre as ‘quelque chose d’ininterrompu avec des passerelles jetées d’un à l’autre de mes livres’ (something uninterrupted with jetties thrown down from one of my books to the next). Further, in the last line of his posthumously published collection Lyyli des 4 saisons, Dib (pre)scribed: ‘Jeux: Prenez des titres dans la Table des Matières et faites-en des poésies.’ (Game: Take titles from the Table of Contents and turn them into poetries.). In assembling Jetties, I have taken the liberty of following Dib’s recipe to the letter. AL: What do you find defines Dib’s style? What made it difficult/enjoyable for you as a translator? You’ve mostly worked with his poetry? The challenge in translating his work is to preserve the ghost of the Arabic language and culture without undue interpretation. MC: I would describe Dib’s style as nomadic, in several senses of the word. His writing migrates from early realist socio-ethnographic novels in the 1950s to metaphysical explorations described by critics as ‘hermetic’, ‘mystical’ or ‘surreal’, in which he freely interweaves an eclectic array of motifs and tropes ranging from the classics to contemporary Western literature to pre-Islamic Odes, but Dib dislocates their original reference systems through subtle shifts in meaning and emphasis. Nomadic also because although he chose to write in French, elements of vocabulary and syntax in Dib’s oeuvre carry the substrate of the Arabic language and intertextual elements often reference Oriental schemas, both of which contribute to what he termed a transcultural ‘reference system’. The challenge in translating his work is to preserve the ghost of the Arabic language and culture without undue interpretation. I have translated both prose and poetry by Dib and enjoyed researching what makes his style unique. In both forms he develops distinctive allegories which invite the reader to ‘world’, or locate, his texts in a time and space open enough to reflect the reader’s world: in his more engaged works, the impact of empire, colonization, slavery, oppression is foregrounded, yet this is often achieved through experiential rather than historical engagement, and while issues of good and evil are raised, they too are stripped of cultural and religious dogma to confront a more originary question on the nature of (wo)man and their relationship with fate. AL: How do you translate Dib’s work into performance? How do you work to decide how it comes together? Do you have video of your performances? MC: The ‘visions’ expressed in Dib’s poetics are couched in the elemental vocabularies of light and shadow, fire and water, space and duration and could be described as a secular transposition of the mystical Sufi Imagination: his singular style serves to hone an acutely experiential expression. Jetties’ first ‘performance’, Haجar and the Anجel, was developed in collaboration with sonic artist Bethan Parkes and visual artist Birthe Jørgensen and took the form of a quadraphonic soundscape and visual installation (21-26 May 2013), which participants were invited to experience from the centre of a platform facing Runciman’s painting. Created with plastic textures and modern audio technology, its transient visual and sound shapes were inspired by Dib’s 1996 L’Aube Ismaël (Dawn Ismaël) and in particular his opening poem, entitled ‘Hagar aux cris’ (Haجar Awakens), which is set in the desert. The concept and montage of this ‘desert-ness’, a term aptly articulated by Parkes in the context of her soundscape of the poem, was elaborated through an iterative dialogue between three collaborators on a creative journey. The installation’s stage directions came initially from a single poem. These directions, however, quickly grew new shoots toward other verses and beyond the sands of Dawn Ismaël to Dibian texts which feature the desert, notably Le désert sans détour (1992) and L’Arbre à dires (1998). Our discussions on the indeterminacy of Dib’s language, and the fluidity of the ‘in-between’ of a work-in-progress, that is, of a piece which is in the process of being translated but where word choices and word order have not been finalized, encouraged me to supply translations of these further texts to my colleagues in this intermediate state: just as, at that stage, our conceptions of the space, the layout of the visual installation and the soundscape were intermediate and open to change. The performers in the process of staging Haجar and the Anجel were the translator, visual and sonic artists, but ultimately it was the viewers, the participants in the lived environment of the completed installation who effectively became its performers. The installation’s vocabulary and reach are now being extended through a series of workshops outside the museum environment, using a digital rendering of the painting and portable sound and visual scapes. In order to develop these workshops, we teamed up with dancers Laura Gonzalez and Marta Masiero and spent some time listening to the poem, the soundscape and installation before developing scores that engage with these materials and environment to stimulate improvisation. Workshop participants are invited to explore the poem and installation through the medium of sound, gesture and movement and to express personal narratives of identity, migration and exile in a safe and enabling environment. A photomontage of these workshops will be shown by the West of Scotland Regional Council (WSREC) in Glasgow during Refugee Week 2014. AL: Why a Syrian reader instead of Algerian? …why not Palestinian, given that Dawn Ismaël was, on one level at least, about the Palestinian Intifada according to Habib Tengour, who in 2007 edited a comprehensive volume of Dib’s poetry. 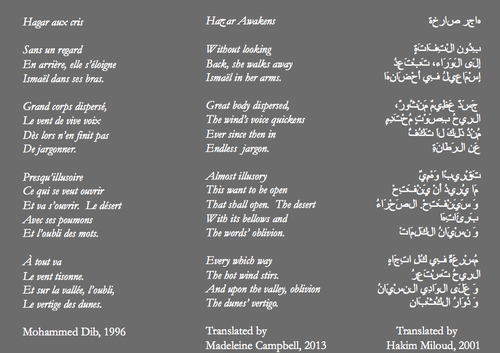 MC: The Arabic translation of the text was in fact by Algerian Hakim Miloud and authorized by Éditions Barzakh (Algiers, 2001) for the purposes of the soundscape. It is a good question, however, and one might also ask, why not Palestinian, given that Dawn Ismaël was, on one level at least, about the Palestinian Intifada according to Habib Tengour, who in 2007 edited a comprehensive volume of Dib’s poetry. 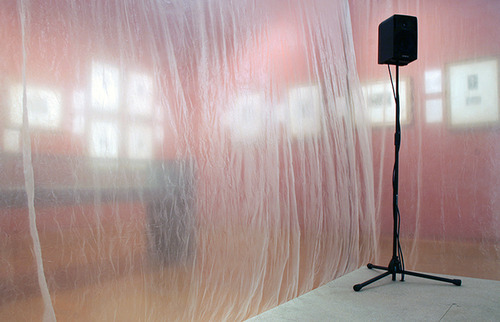 However in Dawn Ismaël Dib chose to rememorate an ancient Biblical tale rather than dwell on specific, contingent political issues.The spirit of Jetties is to stage Dib’s work within contemporary frames and in the context of the Arab Spring this might include voices from all Arab-speaking regions, but the aesthetic conception for the soundscape limited us to two voices in each language, one male, one female, spoken in Scotland today. The Arabic voices were kindly provided by Francophone Algerian Abdelkader Boutaleb and his Syrian-born wife, Dr Tuleen Boutaleb, who both live in Glasgow. These recordings, juxtaposed with Algerian French, Francophone and Scottish voices, serve to situate in present-day Glasgow the Arabic heritage of a poet who chose to write in French, while at the same time offering a punctual echo of current events in Syria, Palestine and elsewhere in the Middle East and North Africa. AL: Three Percent is looking for suggestions for the World Cup of Literature. If you were going to nominate a work of Dib’s to compete internationally, which would it be (and why)? MC: It is very difficult to choose from Dib’s nine poetry collections and over twenty novels, because they display such a variety of themes and style and his oeuvre as a whole defies categorization. In terms of poetry I would have to choose L’Enfant-Jazz (1998), and in terms of prose his novel Le désert sans détour (1992). Whether reading La grande maison, his first novel published in 1952 or Simorgh (2003), the last prose assemblage published before his death, the experience often brings to mind one or several poems from the rarefied atmosphere of his poetry collection L’Enfant-jazz. The passages thus associated are illuminating or illuminated in a different light and this intriguing effect is attributable to more than the idiosyncratic resemblance one would expect across works from a single author. His poetry and prose collections are inextricably embedded in each other, so that one is always in the middle of his universe. Dib often revisits ideas of space, using different geo-historical (North and South) and metaphorical settings (snow and sand). He develops the liminal qualities of these environments in his later narratives, where the location is often vague or secondary. In Le Désert sans détour, a picaresque tale ranging from the absurd to the fantastic or mystical, two hapless characters wander through the desert for ‘four’ or ‘forty’ days (‘Après tout, qu’est-ce que ça fait ?’ — After all, what does it matter?). Somewhere between whimsical chimera and transcendence, Dib’s desert environment confronts the deeply comedic irony of the human condition with his own distinctive brand of dark humour and self-parody. It is a highly readable and humorous yet disquieting book narrated with the wit and skill of a consummate story-teller. However if, as the rules of the Three Percent World Cup specify, the nominated work should be published after 2000, then I would suggest the novel Comme un bruit d’abeilles (2001), which brings together a series of short stories held together by the opening chapter and ranges freely across his perennial exploration of what it means to ‘other’ the other, whatever the historical or socio-cultural setting. It is a highly readable and humorous yet disquieting book narrated with the wit and skill of a consummate story-teller. See, for example, Geomancing Dib’s Transcultural Expression in Translation http://docs.lib.purdue.edu/clcweb/vol15/iss7/. Previous Which Book Should Represent Algeria in ‘World Cup of Literature’?